Hey, hi, it's been two weeks since we announced Defaction and today we will post the first devlog with our new structure and schedule! Instead of just focusing on specific topics we will give some insights on what generally happened in the time between devlogs and each of us will also write about the individual things we've been working on. Something fairly big that happened earlier this week is that we moved into a new workspace! We technically don't need much more than a desk, internet, and some power outlets but we're still happy to be able to work here. This grey bun is our protagonist Coral. 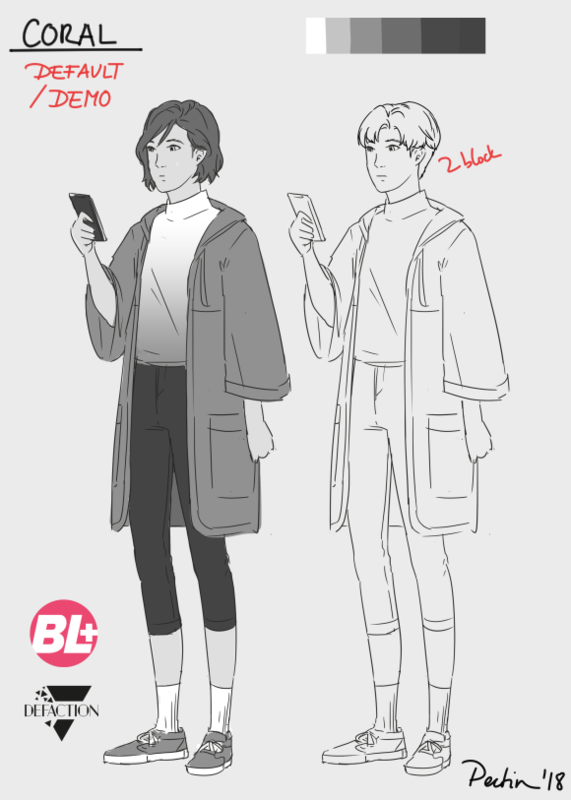 Coral can have different body types, facial features and hairstyles but they will most like wear a raincoat over a gradient shirt and dark leggings with sneakers. Coral has a moderate protagonist syndrom and needs to be prepared for every kind of situation. Part of this comes from their father's survival experience. This was my main theme for them. The raincoat protects against yucky wetness and strong winds. The pockets are big enough to carry items but they're not as spacious as the Pokémon trainer's backpack to fit a bicycle. And leggings are functional. They help regulate blood pressure in your legs which increases stamina for running and they are comfortable to move in! I think most know that sneakers are affordable all-rounder shoes and compliment most outfits. Karin is the super nice and approachable leader of the Avantgarde. She likes hip hop and her outfits which are inspired by culture surrounding hiphop are street proofed. 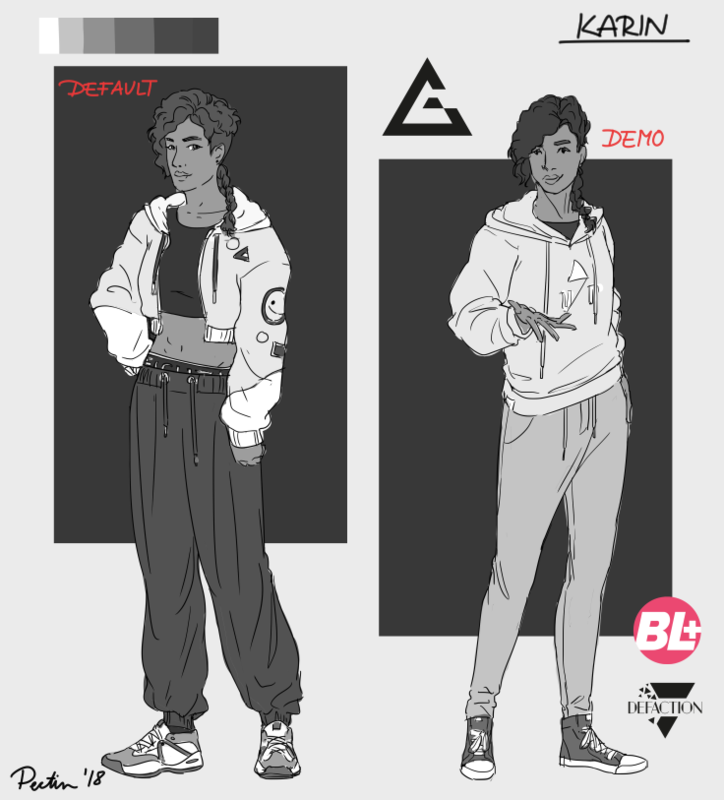 I was looking into 90s hip hop fashion for her default design and would make her wear other old skool outfits in the main game. Yes to sporty crop tops, sneakers and side-swept bangs! t's too bad feet aren't very much visible in visual novel styled games because she would love to wear the finest sneakers. I'm so going to sneak them into the illustrations. Apart from those Karin doesn't really see the need to care too much about what she wears on her body as long as she feels at home in her cottons. This guy is an enigma. Remis wouldn't want to fit into street-style wear or anything too classy. 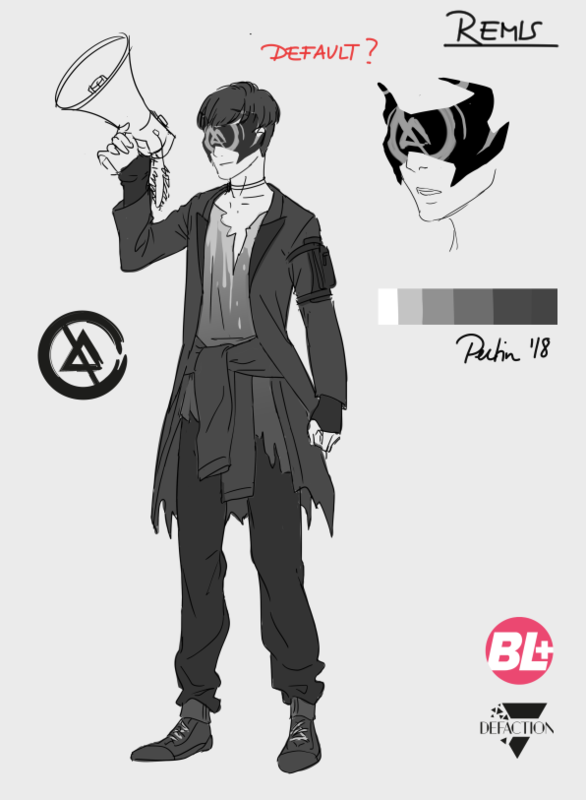 The most important thing in his design is to stay anonymous. I could have packed him into a robe going from his head to his toes but that doesn't quite work with him either. Everything needed to be functional and ready to be used. His mask only covers half of his face to show the mouth for speaking. It's made of coated plastic which allows him to see but no one may spy the individual behind it. 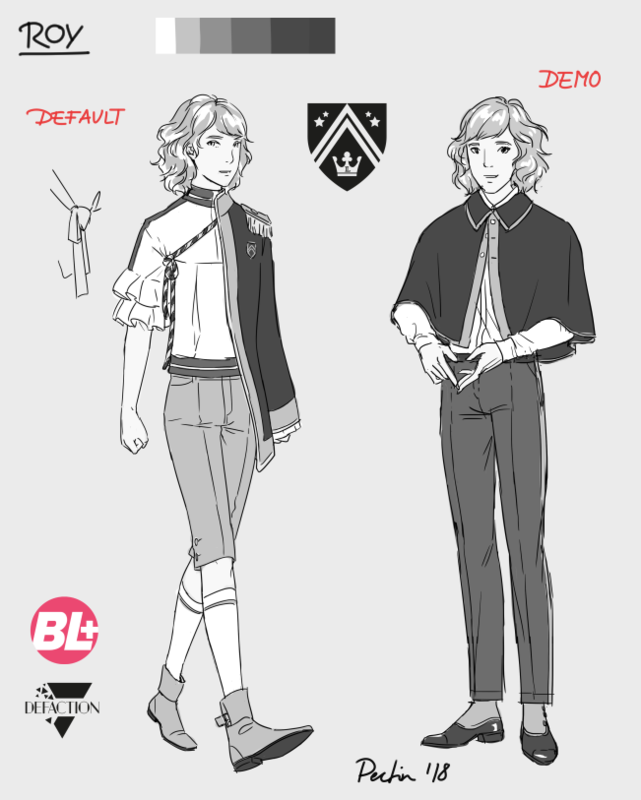 The dressy coat is to show that Remis is a public figure. However it's also just some kind of dress-up for him to get a message across. He could throw it off, untie his hoodie along the waist, pull it over his head and done! If he then packs his mask away, I would guess no one could immediately recognise him when he's on the run! On the development side of things, I spent the last two weeks mainly working on our messenger. Since the chat is one of the central features (and narrative devices) of the game, getting it right is important to us. 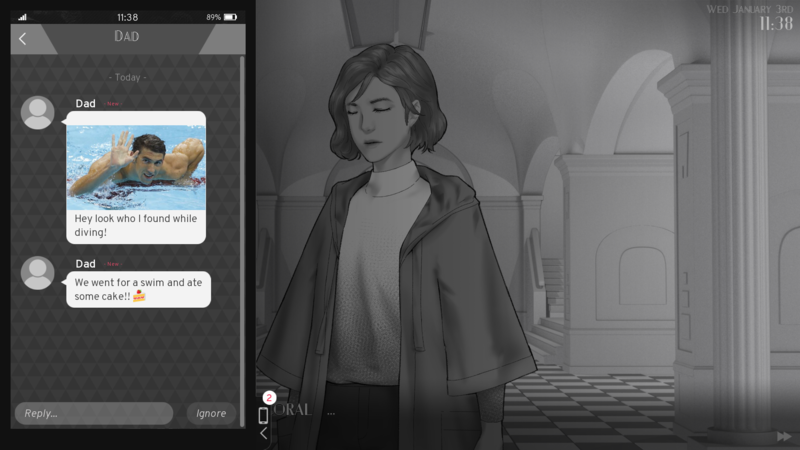 Replies and the logic for branching dialogue in the messenger has also been implemented but I'm still in the process of making sure everything communicates well. 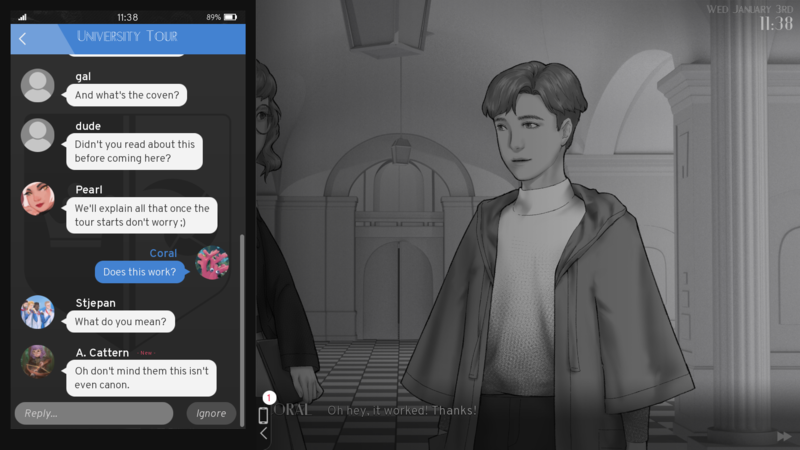 After that there are going to be a lot of polishing tasks, mostly to improve the flow of messages and also some setting to make the messenger more customizable (like custom contact names, assignable ringtones, etc.) BUT... more on that when I actually started to work on those tasks. The messenger itself is split into two general groups: private messages and group chats. They are pretty self explanatory but have some structural differences in how we use them. There are various group chats, most are faction specific and depending on what route you play, you will most likely be in different group chats. Since a lot of people take part in these chats, Coral's role usually isn't that active or significant but even group chats have moments where your input is important, valuable, or even necessary. In contrast, private messages are a lot more character-centric. Conversations usually don't progress unless you reply but they are also more personal and you will most likely learn more about the characters in private messages than in group chats. In terms of content, balancing the different narrative threads of face to face conversations and chats in the messenger is another task still ahead of us, but since a lot of that is dependent on the actual functionality of the messenger this also has to wait until every major feature is implemented. Well and that's pretty much it for this week. We'll be back in 14 days with another devlog. As always, thanks for reading and we hope you found this interesting!